INDUSTRY.co.id - Jakarta - To commemorate the 53rd Anniversary, PT Telkom Indonesia (Persero) Tbk held TelkomGroup FUNtastic Day 2018 which was attended by more than 11 thousand TelkomGroup employees. This activity is also in order to increase public awareness of the XVIII Asian Games to be held on 18 August to 2 September 2018 in Jakarta and Palembang. 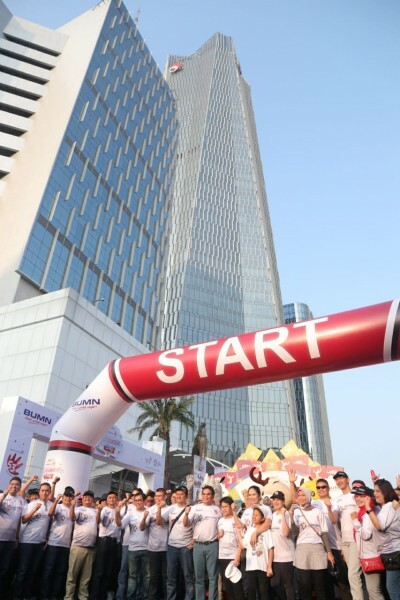 TelkomGroup FUNtastic Day 2018 begins with FUNwalk as far as 5.3 kilometers through car free day which is released by Deputy of Logistic Business, Industrial Estate and Tourism Ministry of State-Owned Enterprise Erwin Hidayat Abdullah accompanied by TelkomGroup CEO Alex J. Sinaga. "In the event of FUNwalk, we not only tighten the ropes of employees of TelkomGroup, but also in order to ' enliven' XVIII Asian Games," said Vice President Corporate Communication Arif Prabowo in Jakarta, Sunday (15/07/2018). Arif added that Telkom's support as an official prestige telco partner is an effort to support the holding of Asian Games XVIII which is equivalent to hosting the Asian Games in previous editions, especially in developed countries. "Information and Communication Technology (ICT) is one of the important infrastructures that support the success of the Asian Games. Therefore, as a state-owned enterprise engaged in this industry, Telkom fully committed to support the Asian Games XVIII through the provision of infrastructure and the best ICT services so that Indonesia can be equivalent to other Asian developed countries that have successfully organized the Asian Games, "said Arif. (Telkom President Director Alex J.Sinaga accompanied by Human Capital Management Director of Telkom Herdy Harman while delivering coaching assistance to one of the outstanding athletes, namely the disabled goalkeeper Eman Sulaeman, at the FUNtastic Day event in commemoration of Telkom's 53rd Telkom Landmark Tower on Sunday (15/7). At TelkomGroup FUNtastic Day 2018, Telkom has the opportunity to give appreciation and support through assistance to former athlete with national disability and sports community. "This is one form of Telkom's concern for the progress of national sport," Arif closed.